TALLAHASSEE – Gov. 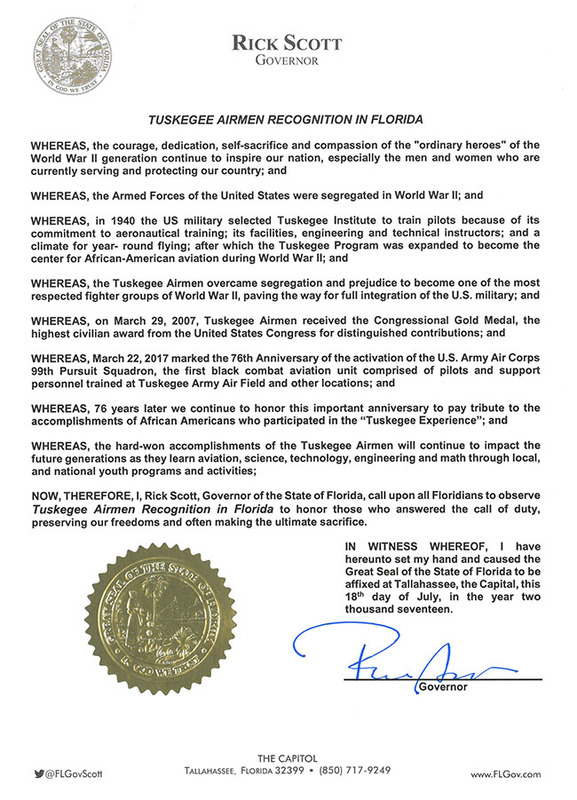 Rick Scott is calling upon Floridians to join him in observing Tuskegee Airmen Recognition in Florida to honor and pay tribute to those who helped pave the way for the full integration of the U.S. Armed Forces following World War II. His proclamation notes the activation of the nation’s first black combat aviation unit 76 years ago in a world at war. Orlando will host the 46th National Convention of the Tuskegee Airmen Inc. on August 3-5, 2017. The national non-profit organization is dedicated to keeping alive the history, achievements and importance of the original Tuskegee Airmen of World War II fame.